WASHINGTON (July 27, 2012) -- In the Pentagon Library and Conference Center here, July 25, dozens of members of the Department of Defense's Muslim community and their families -- including Muslim service members -- gathered to break their Ramadan fast with an Iftar dinner. During the month of Ramadan, Muslims are required to fast during daylight hours. The Iftar dinner, following sundown, is when Muslims break their fast for the day. In 1999, the Pentagon Chaplain's office first hosted such a dinner to show solidarity with and support for the Islamic community. They have been doing so each year since. 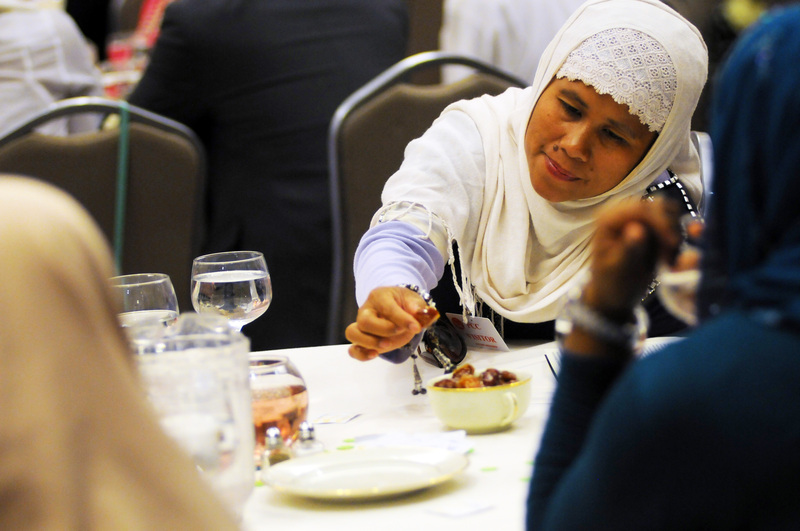 An attendee at the 2012 Pentagon Iftar meal, July 25, 2012, at the Pentagon, reaches for a date in order to break her fast. During the month of Ramadan, Muslims are required to fast during daylight hours. The Iftar dinner, following sundown, is when Muslims break their fast for the day. In 1999, the Pentagon Chaplain's office first hosted such a dinner to show solidarity with and support for the Islamic community. They have been doing so each year since. "It sends a positive signal from our top leadership to thousands of Muslim service members and their families," said Chaplain (Col.) Thomas Waynick, of the Pentagon Chaplain's Office. The Pentagon Chaplain's Office sponsored the meal. "That positive message is that we are a diverse and inclusive organization." Secretary of Defense Leon Panetta spoke to those gathered for the meal, thanked them for the opportunity to share in their faith, and said the gathering is a confirmation of American values. "We are grateful to be able to host this Iftar dinner at the Pentagon and to share in one of the great traditions of the Muslim faith," Panetta said. "We are also able to confirm one of the fundament principals of our country: Our ability to freely practice our chosen faith, and to be able to worship our God, wherever we are." Panetta also said that by including Muslim service members and service members of all faiths in the military, America's military had become stronger. "Our nation and our military are indeed stronger because of the service and sacrifice of people of all faiths, including Muslim-Americans," Panetta said. The secretary said that after the 9/11 attacks took lives of many Americans, including those who are Muslims -- Muslim-Americans have participated in the defense of the United States by fighting in American uniforms. "I am grateful that Muslim-Americans have been fighting for America on the front lines," he said. "They have sacrificed a great deal for our country, and on behalf of all Americans, let me thank them and thank all of our troops for their service." One Muslim-American service member at the event was the emcee for the Iftar dinner, Army National Guard Maj. Jalal Malik. Malik is a theater action officer for both CENTCOM and AFRICOM, as part of the National Guard Medical Services Corps. He also serves as an Islamic Faith Leader in the National Capital Region. Malik joined the Army, initially, in 1999. He said that as a Muslim-American, he feels his government and his military are supportive of him and his faith. He said that others he knows in his faith feel the same. "There is probably not a Muslim that I know who doesn't feel that our government supports us," he said. "We are at least allowed to practice our faith and that is much better than many people can say -- even in so-called Muslim countries." Malik went on to say that he feels his faith and his service to America as a Soldier are in line with each other. "Islam requires me to be loyal to my country," Malik said. "I am very comfortable being an American, being an American in uniform, and being a Muslim." Before the Iftar dinner, attendees listened to a presentation by Ebrahim Rasool, the Ambassador of the Republic of South Africa to the United States of America. Rasool was the evening's guest speaker. At the Iftar dinner, which began at 8:26 p.m., at sunset, those in attendance said a prayer and then reached in to communal bowls on their tables for a date to eat, and also reached for a glass of water to drink. This is a traditional way to break the fast during Ramadan. Afterward, attendees enjoyed a full meal of traditional Middle Eastern foods.